Please park in the designated bays on the front drive and leave your dog in the car until you check-in with a member of staff and instructed what to do next. Access to reception and the pool-room can be gained through the side gates. If your dog has limited mobility you can drive through the gates and park near the pool entrance. Please keep your dog on the lead at all times. 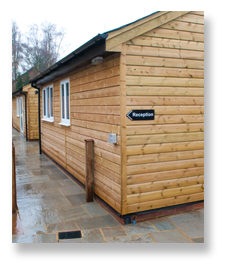 Therapaws has an on-lead policy and no dogs are allowed off lead until otherwise directed by a member of staff. Your dog may be friendly but not all dogs and owners are comfortable with other dogs approaching them. Please toilet your dog in the area provided. Even if your dog went at home it is a good idea to toilet them on arrival as a car journey and going to a new venue can be very exciting! Please pick up after your dog, there is a dog waste bin prodided. If your dog deficates in the pool there will be a fouling fee as it means we will have to shut the pool down in order to sanitise it. Housed in a centrally heated purpose-built cabin the pool measures 4.25 x 2.5 Meters. It is maintained at a temperature of between 27-30°C and is permanently filtered and sanitised. Water testing carried out 3 times daily. We have non-slip ramps to provide safe entry into and exit from the pool. No scary hoist needed to lift your dog into the pool. There are also resting stations at varying heights to accommodate different breeds. 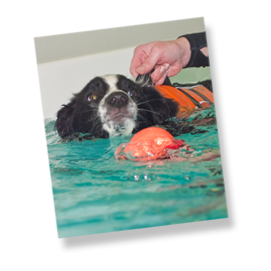 Canine float aids are provided to aid confidence and support your dog in the water. We can provide a range of toys or alternatively, bring your dogs own favourite one. Dry seating is available in the pool enclosure for you to sit and relax during your dogs swim session. Although, sometimes its important for you to encourage your dog while swimming.